From the moment you boot up Banjo-Kazooie and are greeted by its endearing musical intro, it’s clear that you’re in for a wonderful experience. 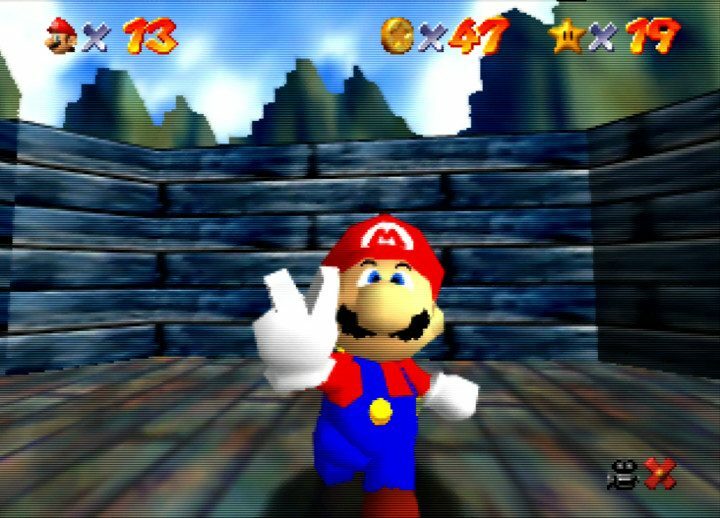 The charming presentation – not to mention that this is one of the N64’s most graphically impressive games – is proof that the team behind it clearly spent hundreds of hours tinkering even the smallest of details to create as an enjoyable an experience as possible. This hard work still pays off nearly 20 years later: Banjo-Kazooie is just as playable as it ever was, and the few minor issues that do exist have virtually no impact on your enjoyment of it. For the uninitiated, Banjo-Kazooie is a 3D platformer, but with an emphasis on open-world exploration. 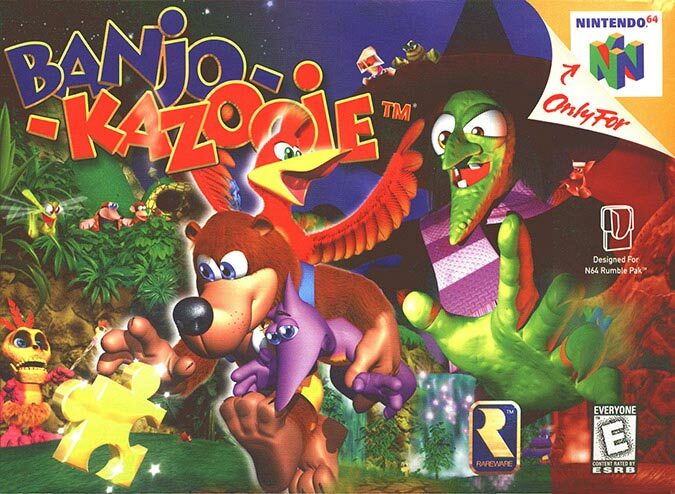 Playing jointly as Banjo the bear and Kazooie the red-brested Breegull, you must navigate nine worlds in search of Jiggies and musical notes – collectable items that enable you to progress through the game to a final encounter with the wicked witch, Gruntilda. This ugly old hag has kidnapped Banjo’s younger sister, Tooty, and plans to steal her youthful looks for herself with a bizarre visage-swapping machine. It’s a simple, albeit daft premise, but it’s most certainly in keeping with Banjo-Kazooie’s lighthearted tone. And just because the game doesn’t have a complex narrative, it doesn’t mean that there isn’t a lot of enjoyment to be found in the characters and events it presents. 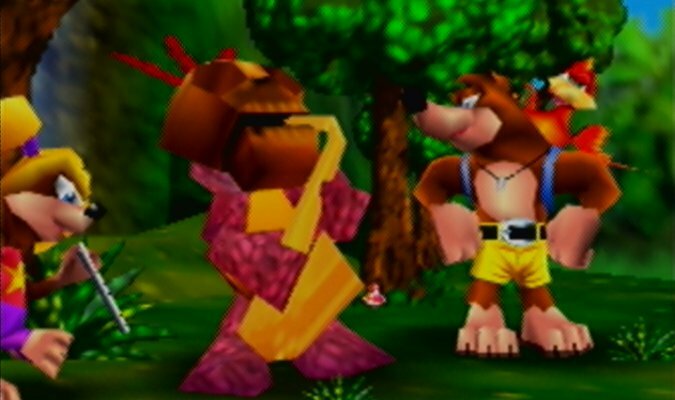 Compared to other platforming games, Banjo-Kazooie features a surprising amount of dialogue that’s laden with personality and Rare’s trademark British humour. From start to finish, Gruntilda talks exclusively in humorous rhyming couplets, while Kazooie’s blunt directness results in some rather unexpected (but very welcome) double entendres. 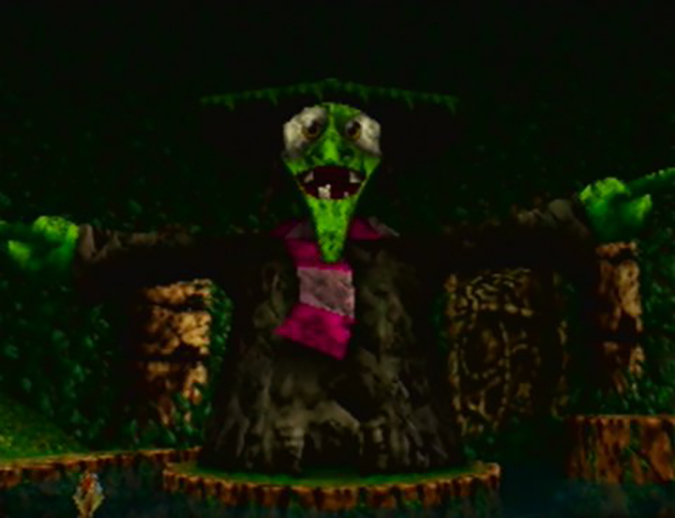 Each of Banjo-Kazooie’s worlds is connected via Gruntilda’s Lair, a hub world that features its own challenges and secrets too. 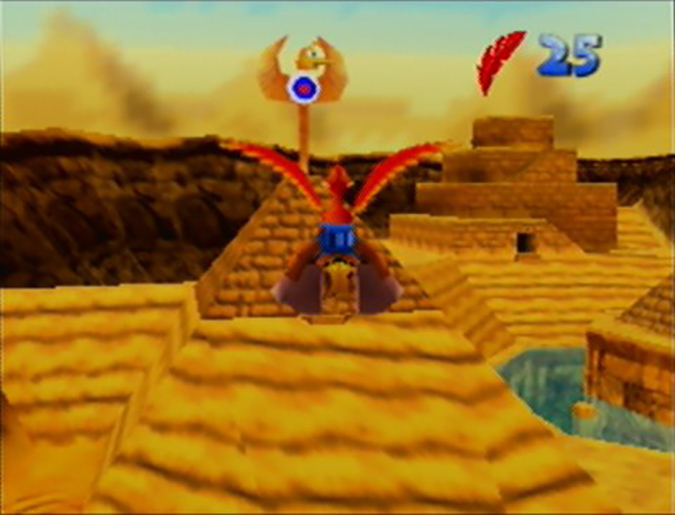 Advancing to the next game world requires you to make progress here too, and just working out where to go to unlock a level can be surprisingly challenging. It’s a hearty adventure that can take up to 12 hours to complete. There are 10 Jiggy pieces, 100 musical notes and 5 Jinjos (magical beings that have been imprisoned by Gruntilda) in each world. Collecting all these items can be as simple as finding them and picking them up, or involve a slightly more complex challenge or task such as solving puzzles, interacting with characters (both friend and foe) and even taking on the appearance and abilities of a completely different creature. 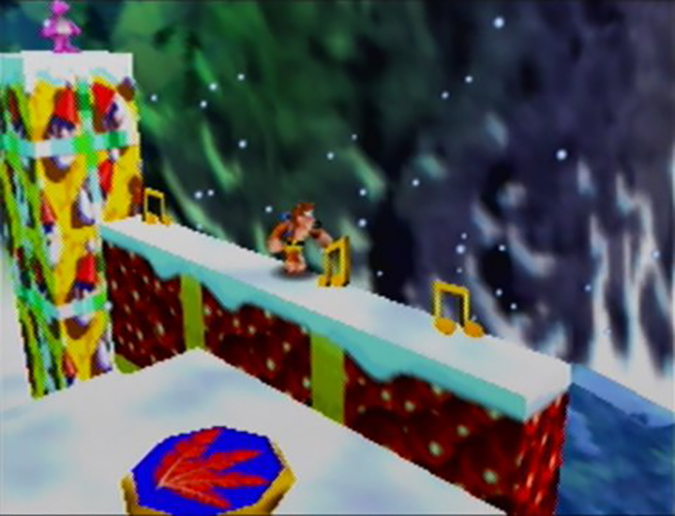 There’s hardly any hand-holding in Banjo-Kazooie, save for the odd cryptic clue, and it’s up to you to explore each world and work things out for yourself. This may be off-putting if you’re used to games giving you some guidance or a waypoint marker. However, the in-game environments aren’t massive, and none of the challenges really require out-of-the-box thinking – you may still need to use a guide at points though. Your exploration is dependent on an early 3D camera system. For the most part it works, but the fixed angles you can switch between don’t always give you the most ideal viewpoint. Being close to walls and objects can also limit its usefulness, and in some rare instances you won’t be able to put it where you want to. 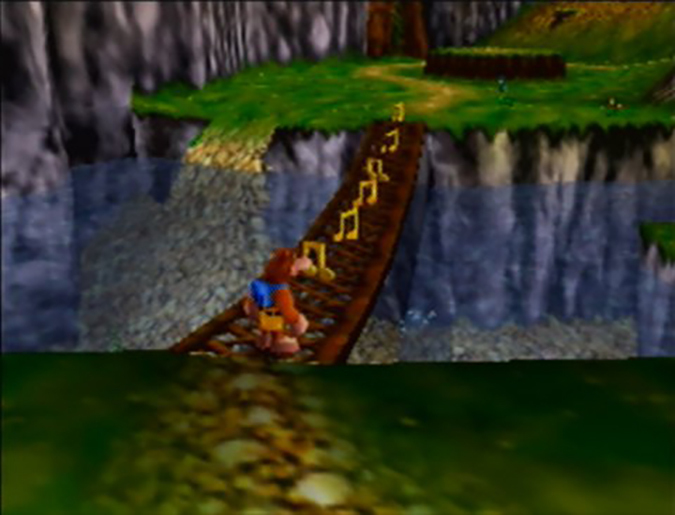 It’s clear that Banjo Kazooie’s development team were very much aware of the camera’s limitations, and so you never encounter a situation where the camera is so bad that it makes the game unplayable. You may misjudge a jump occasionally, but it’s never really a problem; there aren’t a great deal of bottomless chasms to fall in. At most, you’ll lost a bit of time. 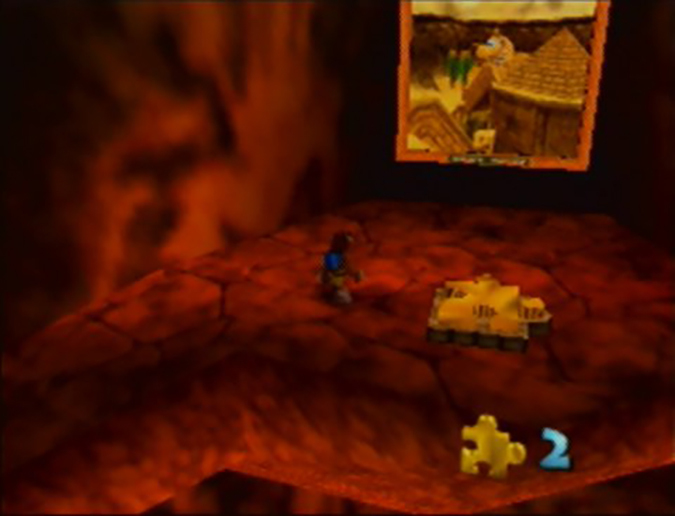 As you advance through the game, you unlock new moves for Banjo and Kazooie to use. These often play a key role in how you obtain collectables, but many of them are also useful for fighting enemies. Despite learning new moves, the majority of the game’s worlds are self-contained, and so apart from a couple of exceptions you very rarely have to backtrack. It keeps things simple, which helps as the Jiggy and musical note requirements to complete the game are actually pretty high. Speaking of which, the musical note system itself may seem overly frustrating today to some players. When collecting these items in each of the world, you must get all 100 without losing a life or leaving the level. If one of these things happens – even if you have 99 musical notes collected – they reset and you must collect them all over again including the one you missed to get 100. 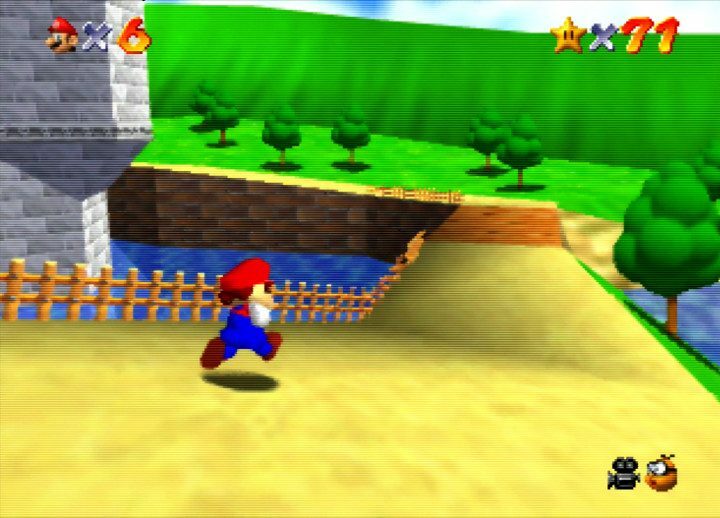 It’s not a major blocker for the most part: there’s only one level in the game where this game mechanic proves really frustrating due to a troublesome platforming segment. It’s worth noting that the Xbox 360 version of the game fixes this (as it only exists in the N64 version due to hardware limitations at the time), so you may want to play that version if you don’t think you’ll have the patience for this. 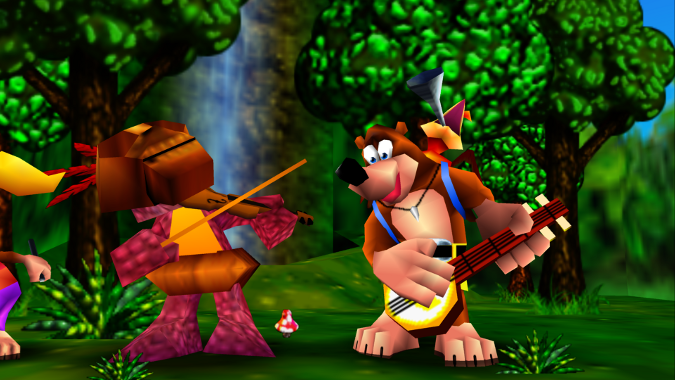 Banjo-Kazooie’s high production values (for an N64 game) complement the fun and challenging gameplay greatly. 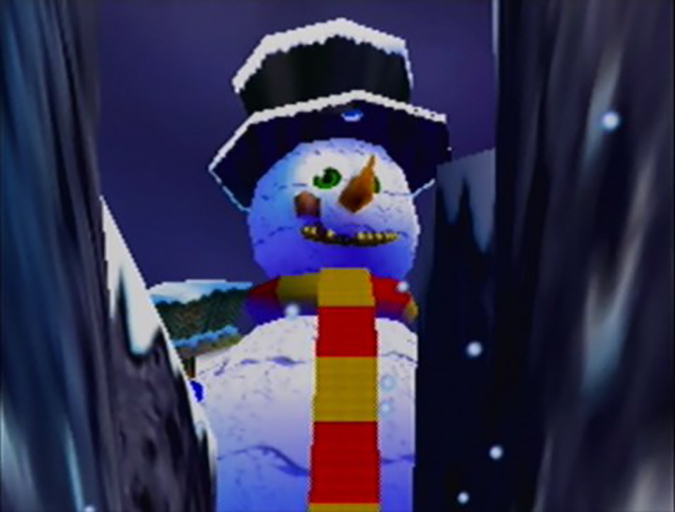 The low-poly character models and basic textures are obviously primitive by today’s standards, but the charming cartoony art style and character design, as well as the varied and colourful environments, mean that the game has aged much more gracefully than all of the N64’s more “realistic” offerings. 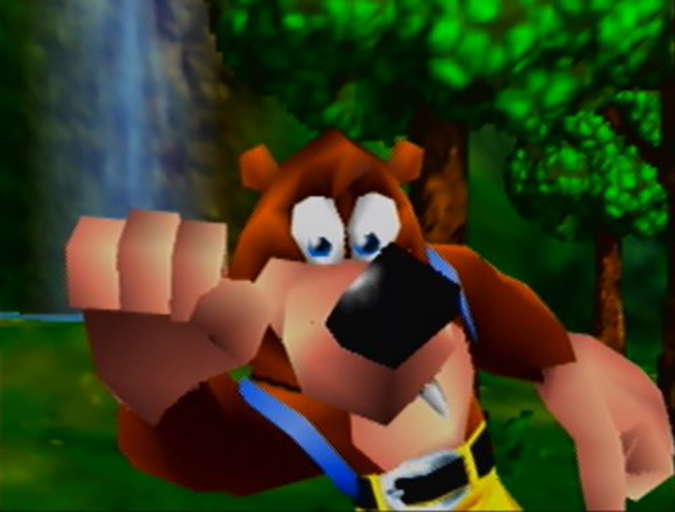 Rare didn’t overhaul Banjo-Kazooie’s visuals for its 2008 remake, and the reason why is because it didn’t need to. The frame rate remains very consistent throughout, with only minor dips occurring now and again. It’s the attention to detail, however, that’s the real icing on the cake. 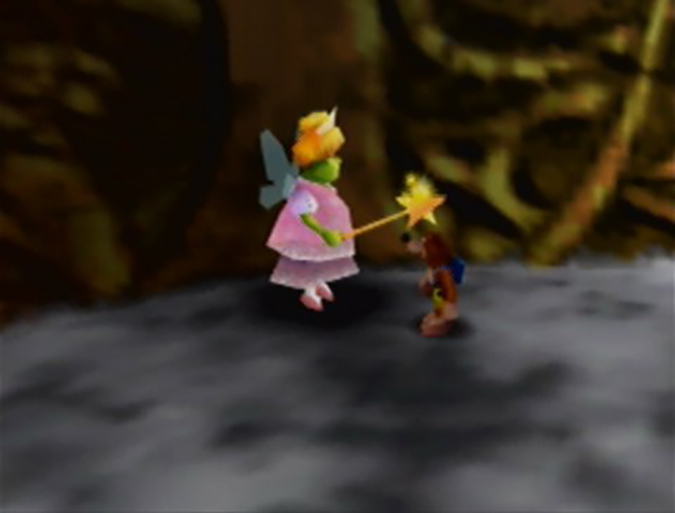 Little elements, such as the amusing idle animations, ripples that appear when you jump in the water, and the way the lighting dims and brightens within a lava-filled cave, sugarcoat the overall experience, adding a sheen of polish that you typically don’t find in other N64 games. To top it off, Banjo-Kazooie sounds as good as it looks. The catchy tunes perfectly encapsulate the environment you’re in and will get stuck in your head after only a matter of minutes. Also, the way in which the music subtly transforms as you move between areas is masterful. Even picking up an item will result in hearing a little ditty or sound, making the experience just that little bit more magical. Almost two decades later, Banjo-Kazooie still delivers a superb gameplay experience. The low-poly count of its visuals may be all the more apparent now, but the art style and exceptional attention to detail still mean it’s a pleasure to look at – the fact that the frame rate remains very consistent throughout certainly helps too. There are a few minor gameplay niggles: the camera is occasionally awkward and the musical note system may prove frustrating, but ultimately it’s still a very playable game that’s bursting with charm, challenge and fun. No serious N64 gamer should be without a copy of Banjo-Kazooie in their collection.